Let me start out, my name is Dan, I live near Reading PA and love to tinker. I have been racing go karts for years and using Briggs 5hp and Honda 390's, building my own engines and a lot of custom parts in basically a miniature sprint car. I just recently sold everything and want to get back into what I did as a kid, farm tractors. I have restored several Farmalls in high school, but since I no longer live on the farm, and wanted to stay true to IH, I got a Cub Cadet. 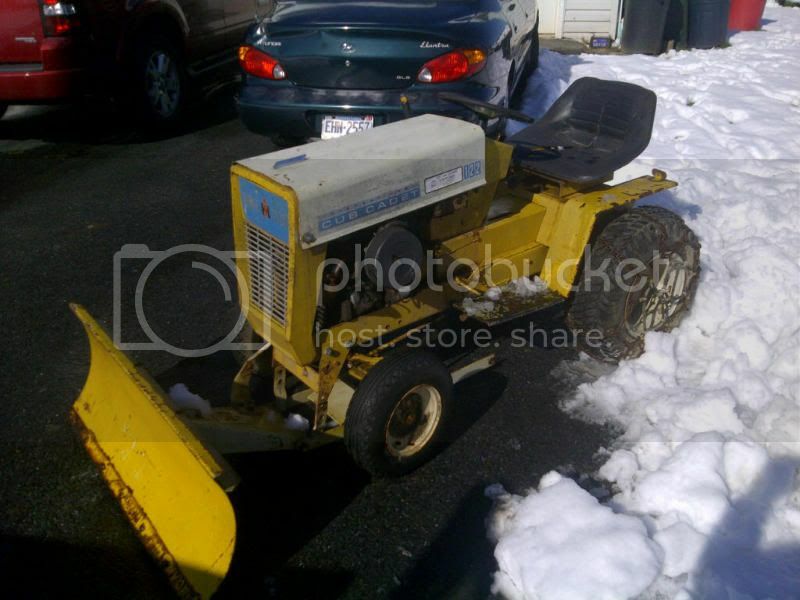 Anyway, I just bought a 66 Cub Cadet 122 this past weekend, no mower deck, but came with a snow plow for $300, that was down from the $600 the guy wanted. It hadn't run in years, took it home cleaned carburetor out and fresh gas and it fired right up! used it the rest of the day cleaning the snow we got Saturday night. So far I have $650 into it and I'm loving it! This is the best garden tractor I have ever seen or owned! 42" Mower Deck, Snow Thrower, Tire Chains and Weights, Rotary Tiller 1, Brinly Sleeve Hitch, Brinly 10" plow, Johnny Bucket Jr.,42" QA NF Dozer Blade. Parts 129 future plans =ported pump for 147, cast iron rear for 1872,129 frame and steering axle= ?wagon? Seems like all of the cub herds are in PA! Yes I'm talking about cub crazy aka Mike! One of our fine site sponsers Rich for Patton Acres is in PA as well! He'll sell you the good stuff at a great price. Nice looking cub 122 greasemonkey!